A powerful tale set in Northern Ireland in 2014 which has its roots in the blood drenched history of the province; forensic psychologist Paula hopes that an investigation into bodies long buried will reveal her mother’s fate in 1993. Northern Ireland makes a very good setting for a mystery about missing persons from its time of The Troubles. 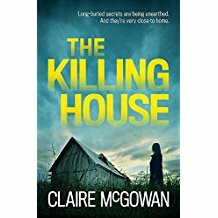 Paula is a forensic psychologist working in London in 2014 who is drawn back yet again to her native Northern Ireland when two bodies are found at an abandoned farm when new owners are doing renovations. Paula has a personal stake in this investigation since her own mother disappeared in 1993 when Paula was a child. The story jumps between the past and the present though spends more time in contemporary times, following Paula’s current enquiries. The two bodies that sparked the investigation are those of a man and a young girl, so Paula’s mother has not been found yet. A claim is made that Margaret, Paula’s mother, is buried on the farm - it was a place used as a ‘killing house’ by the IRA. Paula has moved to London with her young daughter but her heart remains in her birthplace - even though the threat of violence is ever present. She wants to find out what happened to her mother - was she abducted by the IRA or did she escape to start a new life in England? Paula’s life contains other dramatic and emotional events to cloud the proceedings. The atmosphere of the province is well delineated with a good array of characters showing police as well as civilian behaviour. The story reaches a powerful conclusion, making one reach for previous work from McGowan, referenced in this highly prescient novel.